Here comes the holiday gift wrapping season! You can take the easy way out and just use a gift bag and tissue paper but if you believe in wrapping presents there are a few things to keep in mind to make sure the presents are wrapped while minimizing your risk of back, neck, shoulder, or hand pains. 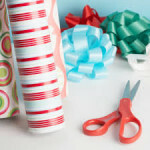 Gather all your presents, wrapping paper, ribbon, tape and scissors so you aren’t running around looking for materials. Wrap presents on a table that comes to your waist level to ensure you don’t have to bend over a lot. Have small pieces of tape pre-cut to eliminate the need to hold the paper in place with an elbow, nose or small child while cutting the tape. Many gadgets exist to make your work easier. While wrapping ensure your wrists are straight, elbows are close to your body (no reaching if possible), neck is straight, and you are not leaning over. If you have a lot of gifts to do, break up the task with other chores that don’t require forward work, just to give your back a gift too.